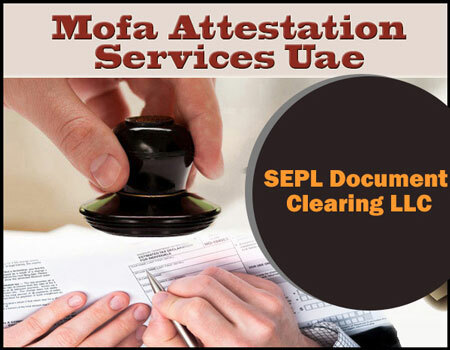 SEPL Document Clearing LLC provides UAE Ministry of Foreign Affairs (MOFA) Attestation services for the general people of the United Arab Emirates and expats who desire to work or are already working in the UAE. UAE MOFA Attestation is obligatory while applying for a Resident permit through the Labor Ministry in UAE. We provide UAE MOFA attestation services for all educational and personal documents originating from India, UK, USA, Australia, Canada, Philippines, South Africa, Singapore, Egypt, New Zealand, France, Netherland, Italy, Seychelles, and UAE. We have been actively undertaking all the services of UAE MOFA Attestation at realistic and competitive rates. We have developed a range of premium facilities to help our customers. We offer online Document Tracking facility to provide current update of the documents to our customers. For UAE MOFA attestation, all the original documents must be pre-attested by the concerned governmental departments of the country which issued them, and then by the UAE Embassy situated in that particular country. MOFA Attestation can be done normally within two days but in case of an emergency basis we get this done on the same day. 1. Educational Certificates- Degree certificate, matriculation certificate, intermediate marksheet, computer diploma, private diploma, technical diploma, etc. 2. Personal Documents- Marriage certificate, birth certificate, fingerprints, death certificate, divorce certificate, Police Clearance certificate, transfer certificate, etc. 3. Indian Commercial Documents- Invoice, Registration, MOU, Partnership deed etc. WHY IS MOFA ATTESTATION OF CERTIFICATES NECESSARY? To attain an Employment Visa/ Labor Card in the United Arab Emirates. To pursue higher education in the UAE or in a foreign country. To write Ministry of Health (MOH) and Department of Health (DOH) examinations. For taking admission in schools in UAE through transfer certificate. To acquire the right of selling property in the UAE. For the removal of LLC partnership, if the partner in other country does not wish to extend the partnership.